Establishing emergency procedures is not just in the hands of facility managers. While building owners and managers are ultimately responsible for ensuring the safety and well-being of all occupants within the facility, tenants need to ensure that their workplace is compliant. Crucial to this process is their coordination with the facility manager to align the tenancy’s emergency procedures with those of the building. 1. Be part of the Emergency Planning Committee (EPC). Every facility must have an Emergency Planning Committee (EPC) as outlined in Australian Standard 3745-2010. As a tenant, it is advisable for you to form part of your facility’s EPC. As part of the EPC, you will help in establishing the emergency procedures and emergency plan of the building. 2. Document your written emergency plan and response procedures. Each tenancy is required to have an emergency plan that is specific for their tenancy. These plans should work in conjunction with the building’s emergency plan. 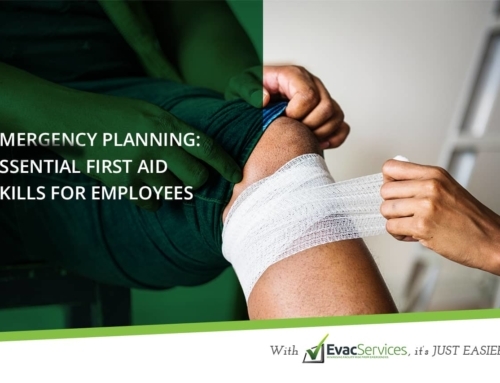 The EPC, ECO, the management of the facility and nominated staff must participate in the implementation and maintenance of the emergency plan, as appropriate to their role within the organisation. The agreed roles and responsibilities of the emergency control organisation and occupants of the facility in preparation for, during and after an emergency The emergency plan and response procedures must also document the procedures for mobility impaired occupants. As part of this process, Personal Emergency Evacuation Plans, or P.E.E.P.s, are required to be filled out for each mobility impaired occupant, and kept with the responsible warden and at the emergency control point. Mobility impaired occupants include both permanently and temporarily impaired occupants. 3. Draft your Emergency Evacuation Diagrams. Evacuation diagrams & signs that provide emergency and evacuation information must be displayed in all tenancies, in locations where occupants and visitors are able to view them. In most cases, building management should install diagrams in the common areas of the buildings. Tenants are responsible for ensuring that there are diagrams installed within their tenanted areas. Of course, this may be different in your building depending on leasing requirements. 4. Establish your Emergency Control Organisation (Wardens). It is important, and a requirement, that the ECO be appropriate to the facility and to the emergency response procedures as documented in the emergency plan. It is the tenant’s responsibility to ensure that there are sufficient and competent wardens identified and trained within their tenanted areas. Tenants should also review the wardens within their tenancy at least monthly to ensure that the ECO is appropriate, and that the lists remain up to date. 5. Ensure completion of training requirements. Tenants must ensure that their general occupants and warden team complete training requirements. The ECO and occupants shall be supplied with training materials appropriate to each person’s role and level of responsibility as determined by the emergency plan. Training materials must be site specific. 6. Ensure general occupants’ participation in evacuation exercises. Tenants must ensure that all occupants take part in an evacuation exercise, at least annually. When it comes to emergencies, nothing beats being prepared with the proper mindset, training and equipment. Since nobody can predict when an emergency situation or a disaster will strike, it becomes even more important to take on an attitude of preparedness so as not to waste precious time and energy when it matters the most.